fred avolio's musings: What Character Are You? Okay, so why am I disappointed? I took this test. I saw it at a friend's weblog. I thought it would be fun to take. He was "rated" as "Yoda." Me? Well, you see: Galadriel. Should I be insulted? What's it say about me? Well, probably nothing. :-) No, I'm secure enough not to mind, and even to post this. And, anyway, when you look at the results of everyone who took the test, Galadriel is #1 with over 42,000 matches. I am moving my blog from one format to another, as I mention up there in the top right under "Under Construction." I just moved this entry and just retook the test. Darn. 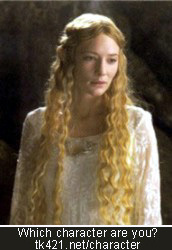 StillGaladriel.